We specialize in offering a wide collection of Non Remy Blonde Hair Extensions, which is process by us using higher quality human hairs. Divali Non Virgin Remy Hair supplies the best quality of Non Remy Blonde Hair Extensions in India. We have all size available and best quality. It is shine, soft, thick and no tangle and no shedding, with high quality. Our Non Remy Blonde Hair Extensions without chemical process. We have provided with the list of best hair extensions that are available in India within easy budget. And you can be easily colored and bleached. Hair can last for a very long time depending on how you maintain it, take very good care of it for the lasting longer. Non Remy Blonde Hair Extensions need to take good care of it. It’s important to use a good conditioner and a good shampoo this will help keep your hair from becoming dry, damaged, and brittle. They will stay securely in place without need for hairspray or teasing of your natural hair. 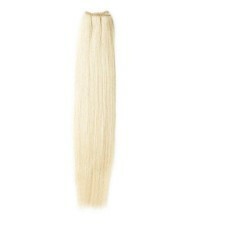 20" Non Remy blonde hair extension 3 BundlesPack 1 BundleSWeight 100 gm (each extension 100 gm)Style..